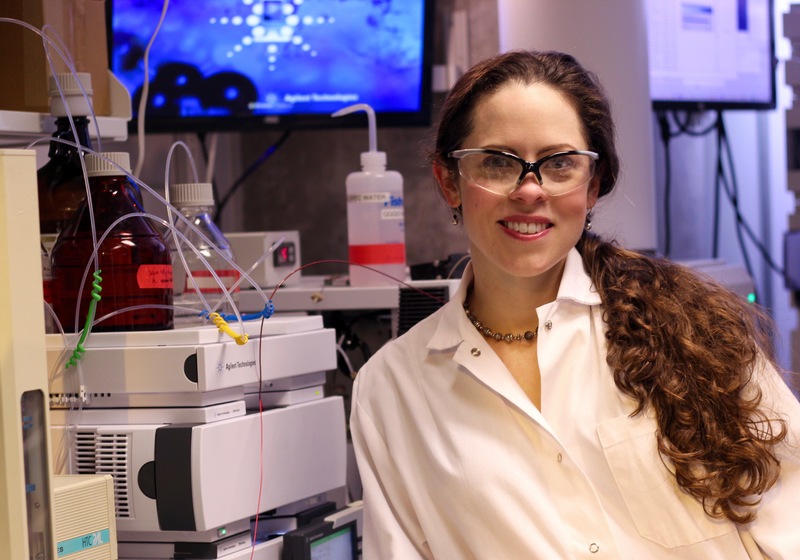 Professor Amy Caudy, pictured in her donnelly centre lab, seeks to uncover new enzymatic pathways in cells. Amy Caudy knows all about recycling—"use it up, wear it out, make do or do without” was the family adage on a farm where she grew up in Sunbury, Ohio. Now these same principles are guiding Caudy’s study of cell metabolism at the University of Toronto. Caudy holds the Canada Research Chair in Metabolomics for Functional Enzyme Discovery, an appointment that has been renewed for another five years as part of the national program that aims to recruit and retain top research talent in the country, the federal government announced today. Advances in technology have transformed the study of metabolism— the chemical reactions by which cells break down nutrients to fuel growth and repair. But they have also revealed major gaps in our understanding of these processes. For example, genome sequencing has revealed dozens of genes for “missing enzymes” thought to catalyze the chemical reactions which have not been discovered yet. And, thanks to improved methods for chemical profiling, researchers are uncovering in cells hundreds of new metabolites, products of chemical reactions, for which they have no clue what they are doing or how they were made. Caudy is filling these knowledge gaps through her research on yeast and cancer cells with applications that range from clean fuels to drug discovery. In one recent example, the lab discovered a previously unknown chemical in yeast. In trying to find out how this chemical was made, the team ended up uncovering an entirely new pathway for making isoleucine, a staple amino acid and a building block of proteins—and one that scientists thought they had worked out a recipe for more than half a century ago! The alternative pathway had previously been observed only in a handful of rarely studied bacteria and this is the first time that anyone has found it in more complex yeast cells, said Caudy. Unlike bacteria, yeast cells are “eukaryotic” because their DNA is encased by the protein envelope, same as in all plant and animal cells. “The whole thing just underscores that even in yeast, our best-known eukaryote, there are metabolites that require explanation,” says Caudy. One potential application of the discovery is in green energy as one of the products of the new isoleucine pathway looks like a precursor for butanol, a desired biofuel. Caudy grew up as a single child on a 400 acre family farm where her parents still live. Her mum, a teacher, who also has a masters degree in nutrition, and dad, an engineer, were always supportive of Caudy’s inquisitive mind. Also, “school was awesome compared to working on a farm—you go and sit all day instead of having to dig holes and sweat,” said Caudy. In 1999, after graduating from Washington University (WashU) in St. Louis, MO, Caudy joined the lab of Professor Gregory Hannon at the Cold Spring Harbor Laboratory (CSHL), NY, for a PhD. At CSHL, she began investigating an obscure cellular process known as RNA interference, or RNAi, that had been discovered the year before in worms. RNAi works by silencing gene’s messages and it was not before long researchers turned it into a tool for switching off genes at will, netting its discoverers, Craig Mello and Andrew Fire, the Nobel prize in 2006. During her PhD, Caudy uncovered the key components of the RNAi machinery in human cells and helped build the RNAi-based tool for silencing human genes, which has been widely used in academic and industry research. After graduating, Caudy returned to WashU for a brief postdoctoral training in immunology before taking on an independent research position as a Lewis-Sigler Fellow at Princeton University, NJ. The prestigious fellowship gave Caudy the freedom to pursue a long-standing interest in metabolic control of cell growth. Working with yeasts, Caudy discovered a role for a “missing enzyme” in a new metabolic pathway for making ribose, a building block of DNA, which had been overlooked for decades. Finding such missing links in metabolism opens new avenues for drug discovery. “You can make great drugs by inhibiting metabolism,” says Caudy. The lab’s work in yeasts opens new possibilities for drug discovery. When you know how an enzyme works then you can start engineering molecules that block as is the case with many anti-fungal medicines, said Caudy. The same approach can be applied to cancer cells. As part of Stand up to Canada Cancer Dream Team, led by Professor Peter Dirks,­ from the Hospital for Sick Children, Caudy is investigating metabolites that are unique to rogue stem cells in the brain that fuel glioblastoma, a highly aggressive form of brain cancer.